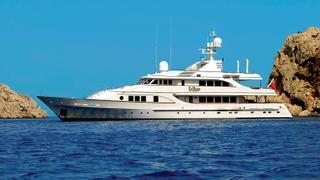 The 43 metre motor yacht Eclipse has been listed for sale by Alex Lees-Buckley at Camper & Nicholsons International. Built from a steel hull and aluminium superstructure by Dutch superyacht yard Feadship to Lloyd’s class, Eclipse was delivered in 1993 and refitted in 2008. She has been carefully maintained ever since and has proven herself as a very popular option on the charter market. Her luxurious interior was designed by Terence Disdale and accommodates 12 guests in six staterooms consisting of a master suite, two doubles and two twins plus a single with a Pullman berth, all with en-suite bathroom facilities. Meanwhile, the crew quarters of this yacht for sale allow for a staff of up to ten people. The spacious aft deck features fixed seating against the aft bulwark and there is a large outdoor dining table and chairs, ideal for casual and formal dining. There is also a bar area with a fridge and ice maker. Moving forward and the elegant skylounge offers comfortable seating arrangements and a card table. The sun deck has built-in seating, a large spa pool forward and a full wet bar along with two large parasols aft and a small crane for launching and retrieving two large Jet Skis. What’s more, her large swim platform allows two large tenders to be carried with ease. Twin 775hp Caterpillar engines give a cruising speed of 12 knots, a maximum speed of 14 knots and a range of 3,700 nautical miles. Fitted with zero speed stabilisers, Eclipse is asking $10,950,000.